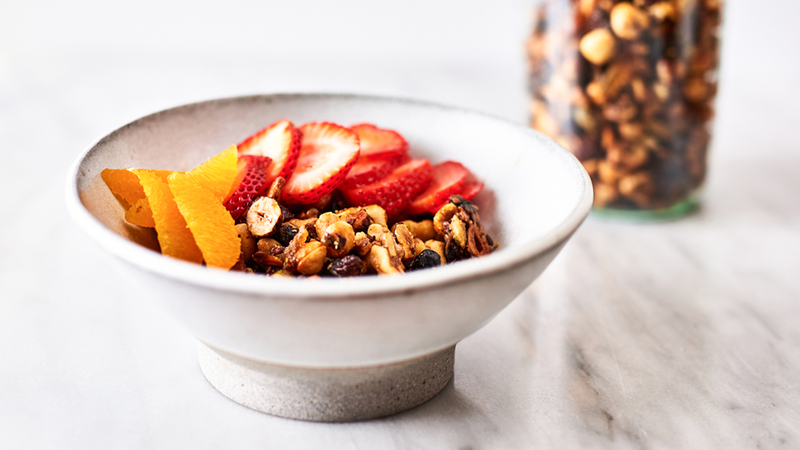 Since nuts and seeds all on their own embody the barre3 protein, fat, and fiber food-balance ideal, this granola is a smashing way to kickstart your day. Baking the nuts helps break down the nut-cell walls, making them easier to digest. You may add your favorite dried fruits and coconut flakes for a balanced on-the-go breakfast or snack. Recipe courtesy of Ashley Marti, chef, food stylist, and founder of Local Haven. Mix all nuts, seeds, coconut flakes, fruit, and orange zest in a large bowl. Slowly pour the maple syrup, honey and coconut oil over the nuts and fruit. Be sure to stir the mixture while pouring to evenly coat everything. Lay parchment down on a baking tray to prevent sticking. Spread the granola on the tray as evenly as possible. Bake for 45 minutes to 1 hour, stirring occasionally until golden brown. I just made this and followed the tip to use a glass baking dish. I stirred about 2-3 times throughout and baked for only 40 minutes. Turned out wonderfully! 45 minutes was way too long in my oven. Definitely burnt 🙁 be sure you keep an eye on it, I’d say every 5 mins or so. So heavenly! I did it with dried pineapple. tip: cook in a glass baking dish. When i cooked this, one baking dish was metal, while the other was glass. The half batch in the metal pan burned while the batch in the glass pan was perfect. 45 minutes is far too long if using a thin metal cookie sheet.